Let's start at 2 a.m. - Sunrise Vata Time: The body prepares itself to wake and start moving. Dreams start happening, there is movement in the bowels preparing for elimination, and the mind is closest to the higher self. It is best to wake 1 hour to 1/2 hour before sunrise so that you rise with the vata energy of movement. You will be surprised how energized you feel the rest of the day. Once sunrise hits, kapha period starts and you could have a groggy start to your day. So wake up, go to the bathroom (vata is responsible for elimination), drink water, and do your yoga and/or meditation. You could also exercise at this time of day because you will get moving easily. 6 a.m. - 10 a.m. Kapha Time: The energy of kapha is slow and steady. Eat a light breakfast around 7 or 7:30, just enough to tide you over til lunch. Your agni is weak from the night's rest so you have to rekindle it. Kapha time is a great time to get the mundane tasks out of the way, cause kapha follows. Think about it, when you get to work, you're not really creative or ready for any heavy strategy are you? Wouldn't it be nice to just follow a simple task list, right when you get in, to get a bunch of thing done? That's kapha. 10 a.m. - 2 p.m. Pitta Time: Get ready to strategize, make new goals, organize, and analyze! This is pitta time and thoughts, perceptions, discriminations, and intellect are at their peak. Have strategic meetings now, when people are their sharpest and ready for a challenge. 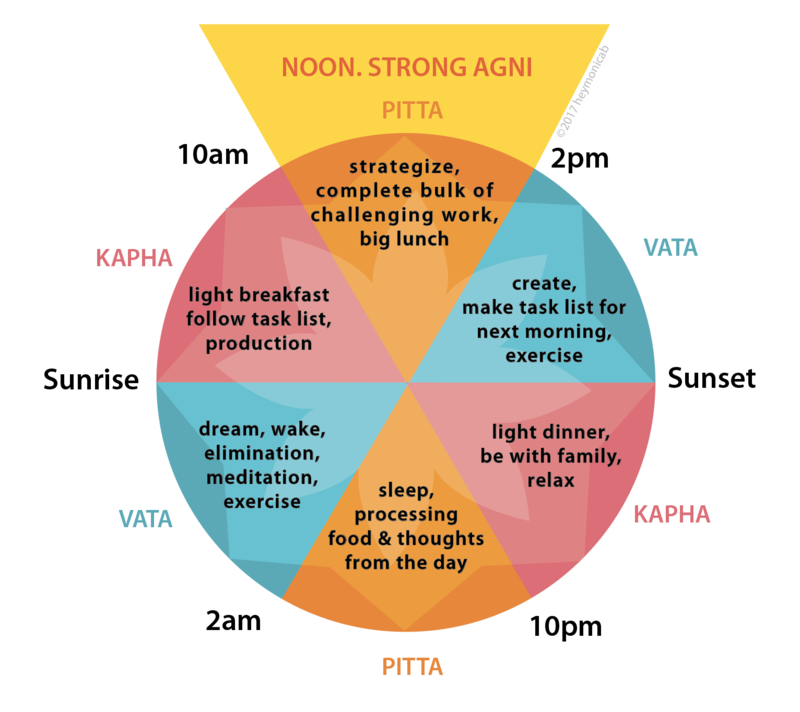 Noon is also when agni (digestive fire) is strongest (because agni and pitta relate to the sun and sun is strongest around noon) so eat lunch at noon and make it your biggest meal. 2 p.m. - Sunset Vata Time: At about 2 or 3, you are getting a little antsy...you might need a snack or you might feel a little bit chatty. Right? That's vata wanting to move. You're probably not really hungry, but you're getting bored and your mind wants to wander. If you have afternoon meetings you might have a wandering mind and end up with doodles on your notes. This is a great time to create and innovate!! Creative work should be done at this time of day. And at the end of the work day, make a task list for the next morning. This will help your vata stay organized and your kapha will love to have a list when it gets in in the morning. Sunset - 10:00 p.m. Kapha Time: Relax! Have a light dinner. It's kapha time so agni is not as strong. It's time for family, relaxation, nurturing, and winding down. Get to bed by 10 so that you start sleeping in the slowness of kapha. 10:00 p.m. - 2:00 a.m. Pitta Time: If you've stayed up past 10 (yea, most of us do), do you feel like you get a "second wind" and your brain starts going and you start working out the days problems in your head? That's pitta kicking back in. Pitta will digest all thoughts, perceptions, foods, and everything given to your mind and body from the entire day. Pitta is working hard to move all that stuff through the entire digestion process. If you stay awake past 10, you might have a hard time falling asleep because your body and mind is a processing machine! 2:00 a.m. - 6:00 a.m. And back to Vata: Where it eliminates all the stuff that pitta digested...and gets ready to start a new day fresh with new choices, new challenges and a nice task list waiting on their desk.